HON03-AUX Honda auxiliary input Interface, Honda aux this interface provides a new audio input source to the Honda factory car Stereo. Honda Radios need to have an AUX XM or SAT button to input audio into the radio as an auxiliary audio input converter, the AAI-Hon03 allows you to plug in an external audio source to the Honda radio, like a portable Mp3 player, iPod iPhone, satellite tuner, DVD player or any portable audio source. Installation is simple one end of the plug and interface connects into the rear plug on the Honda Radio in the other end of the interface you can plug RCA jacks to 3.5mm jack or use our Dash mount aux jack works with Honda XM tuner or CD-changer. Auxiliary RCA audio input, for select 2003-2011 Honda vehicles. Hon03-Aux. Honda Radio must have an external CD-changer or satellite capabilities, Aux XM or SAT button. Compatible with factory external Honda CD-changer and in dash CD-changer. Compatible with factory RSE (Rear Seat Entertainment) present, rear Honda DVD. 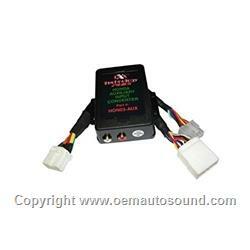 Compatible with factory Honda satellite radio. 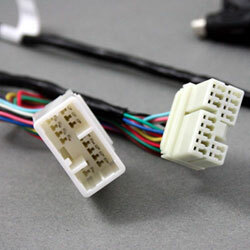 Hon03-Aux Connects to 14-pin (White) connector on the head unit. The PIE HON03-Aux can work in one of two modes (depending on what the factory radio is capable of) providing greater flexibility and vehicle coverage. The HON03-Aux can be configured to work in either mode (external Cd changer or satellite), allowing retention of any existing factory installed accessories such as navigation, rear seat DVD, CD-changer, or satellite radio. I bought this for my 2004 Honda Accord with remote CD player. I considered replacing the stock head unit but I wanted to keep the factory look. This input was easy to install and works very well. I use it to stream Pandora through my phone to the head unit. I mounted the jack inside the pocket box and ran the cable to the phone. The sound quality is good and this was a perfect solution for my need to add an aux in and keep the stock Honda look.